I can tell by the calls, messages, etc. that I need to give an update on Suzie and her cancer fight. First, the positive results. Every three weeks the medical team draws blood to check the status on how prevalent the cancer is in her system. Since she has been receiving chemotherapy treatments, her main cancer indicator has dropped 65%. It is still far beyond where she was six months ago, but the drop indicates that the chemotherapy is moving out some of the cancer. Second, the negative results. The sum of cancer plus chemotherapy is taking a toll on her body. She has lost significant pounds, is weak, and experiences pain. 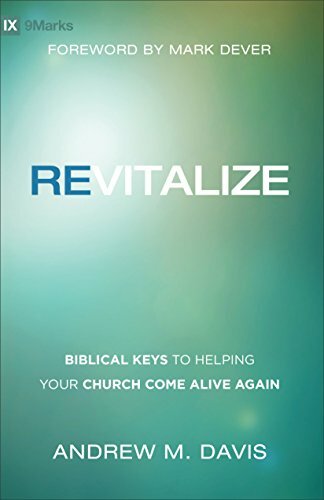 I recently finished reading and reviewing Revitalize: Biblical Keys to Helping Your Church Come Alive Again by Andrew M. Davis. Andy kept my pen busy with marking helping quotes and other such things. Here are my favorite 10 Quotes from Revitalize (in order of appearance in the book). Even if you do not have the book, I hope you will ponder each quote and consider its application for your life. Does your church demonstrate the life and vitality that a New Testament church should? If not, then Andy Davis’ book Revitalize is a book for you to get onto your reading list. I had the opportunity of sitting next to Andy during church history doctoral studies at The Southern Baptist Theological Seminary. He is a personal yet serious minded student of the Scriptures and of the history of the church. The Lord has used him to lead in the revitalization of the First Baptist Church of Durham, NC. The story of God’s work in that church is nothing short of amazing. In this book Andy brings to print the lessons he learned and applied during this revitalization. He also brings to bear the experiences both in Durham and in the broader scope of church history. In 1740 John Bonar wrote a reply letter to a new convert. An interesting note is that Bonar himself was only 17 years old at the time. Yet his writing, including these 9 words of advice, demonstrates a grasp of the Christian faith well beyond his years. The young Scotsman’s words are still applicable to the modern Christian whether a new convert or a seasoned saint. I hope you will chew on them and use them as a tool of self examination. You will no doubt meet with solicitations from Satan, your corrupt nature, and a wicked world, to give over the enterprise, but stronger is he that is for you than all your enemies. If you are new to this website, you will discover occasional articles titled Concierge. The title comes from my days in the hotel industry in which I often directed guests to worthwhile places to eat or to visit. This blog feature does a similar task pointing guests to worthwhile destinations on the internet. I provide a comment and a pertinent quote from each article. You will want to click on the title of each article to read it in it’s entirety. You can watch the one video link on this page. If you know my story, you know that my wife Suzie is greatly effected by a second bout of ovarian cancer these past couple of years. So this article has real personal application for us. When you set yourself to do the work of the Lord, you will inevitably come under attack from the enemies of the Lord’s work. The Christian faces a triad of enemies — the world, the flesh, and the devil. The enemy strategies for attack come at us from various sides. These sides present themselves in Nehemiah 6. In this passage Nehemiah is busy doing what the Lord called him to do. He was leading God’s people to rebuild a wall around the city of Jerusalem. Now we are considering the third front of attack. It is the Enemy Strategy on the Spiritual Front. Do not think for one moment that our enemies are not spiritual. Paul reminds us of this in his letter to the Ephesians. Oh, Christian, does your soul need reviving? Do you need life to spring afresh within you? Is the flaming of the Holy Spirit in the depths of your being merely a flicker? For about 17 years, I had the privilege of serving as a pastor of Southern Baptist churches. In 1997 I sinned against the Lord, left the ministry, and followed a prodigal path. Thankfully the Lord did not cast me off. He drew me back to himself and restored my joy. I was serving as one of the preachers-teachers at First Baptist Boynton Beach in South Florida, but have relocated to the DFW area of Texas. If you want to be challenged and encouraged to walk on this pilgrim pathway, perhaps this blog will help. ©2019 FrankGantz.com. Powered by the Get Noticed! Theme.